The Sega Master System was the 8-bit console of my household back in the day. Without a Tecmo Bowl to be had, Great Football was my American Football game of choice (i.e. the only one). If you haven’t heard of it, that’s not surprising – it doesn’t even have an entry on Wikipedia (yet!). Great Football was released way back in 1987. For the sake of reference, Windows 3.0 was still 3 years away, and even Mac OS’ System 6 wasn’t released until 1988. Don Norman’s now-classic The Psychology of Everyday Things (later The Design of Everyday Things) wasn’t published yet either. So usability…was a little different back then. 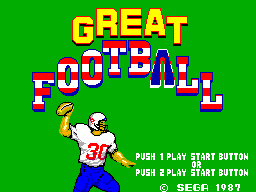 Great Football for the Sega Master System was a pretty typical 8-bit sports game, and to be honest, it hasn’t aged well. There are lots of reasons why, but one thing that particularly stands out as being extra terrible is how the players have to choose a play.